For more than thirty years microfinance has been portrayed by a large bulk development theorists and practitioners as the foremost tool for poverty reduction and social development in the third world. Grameen Bank boasts over 6.91 million borrowers in Bangladesh; the awarding of the Nobel Peace Prize can be seen as the culmination of three decades of successful expansion of what has been termed as the “Grameen system”. This has been adopted by development organisations the world over, most notably BRAC; the world’s largest development NGO. 1. Start with a survey of the social background of the loan recipient. 2. Carve out grassroots relationships. 4. Restrict credit to income generating operations and make it possible for the borrower to be able to repay the loan. The majority of Grameen Banks programs specifically target women on the basis that they are more likely to be credit restrained then men, have restricted access to wage labour market and inequitable share of power in household decision making. “Gender empowerment” is the rallying call for microfinance initiatives (MFI). Pitt and Khandker stress that bargaining power within the household is quantified through each members utility, “In a simple version of collective decision making, the household’s social welfare is some function of the individual utility functions”. Pitt and Khandker then cite the empirical research of neo classical economists Browning and Chiappori to bolster this argument. Research conducted on Canadian households. Several complications arise from this linear method of delineating female empowerment from economic capability; which is an issue with neoliberalism and its compatibility with feminism. However one theme that arises across the spectrum of microfinance plaudits is their inability to acknowledge the inexorable link between credit and debt. Liquidation of assets by families in order to meet deadlines but this comes via a process. BRAC, the largest NGO in the world and operating Grameen style MFIs in Bangladesh adheres to the following policy. 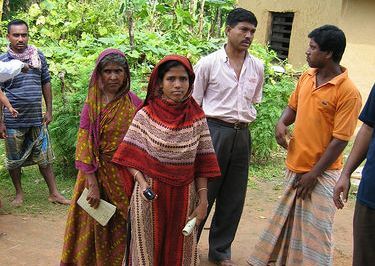 Firstly, the kin of the indebted person is approached, if this fails, field staff work through Village Organisation (VO) leaders (invariably men). Field staff threatens complete withdrawal of credit if one borrower defaults on the loan repayment. Social pressure or what can commonly be coined as bullying is then employed by the VOs. Often this is just the tool needed to ensure swift repayment but if this fails the VOs are directed to reclaim livestock, cooking utensils, ancillary housing equipment and homes. What is crucial to note is that “staff pressure” is key in triggering “peer pressure” and so the resulting destitution of households caught in the microdebt stems from BRAC policy. In depth studies show that although microcredit has aided numerous families in Bangladesh, a certain section of borrowers under particular circumstances such as delayed investment returns, loss at the initial stages of business development are often unable to repay the debt. The result is being caught in an endless cycle of debt. Even when successful, Microfinance enterprises displace existing businesses and scramble the pre-existing fixed level of demand. Is microfinance a successful route out of poverty for those in the third world? Microfinance enterprises are essentially a gamble, and in the time of global capitalism any business venture is like rolling a dice, however in a globalised world where the playing field is often uneven, it is the first world that inevitably benefits. One of the most attractive themes of MFI is its claim to empower women; owning your own business, to the neoliberal development theoreticians, equals breaking the bonds of patriarchy. The interactions of Professor Lamia Karim with a Bengali widow illustrate how MFI enforces patriarchy rather than dismantling it. It is problematic to laud the claim that microcredits economic empowerment facilitates the erosion of structural patriarchy as the program fails systematically to take into account cultural contexts and societal trends. Rural Bangladesh has an extremely complex social makeup in which anthropologists and sociologists have written a plethoric number of books and journals on, none of which come with a singular route to empowering women. MFI’s serve to uphold the neoliberal agenda which dominates development discourse. Fresh ideas and concepts need to be brought to the table if there is to be any real progress in eradicating poverty.